Helping kids love reading... one letter at a time! Letter P.A.L.S. is a kindergarten-2nd grade school to home reading program to get teachers, students, and parents reading together weekly, and motivate children to become strong readers. The site is well designed, colorful, and easy to navigate. The left side menu leads to the main areas of the site. Registration is required but is free. Teachers sign up for their classes to receive an identification number and then parents sign up under the teacher's identification number allowing the teacher to keep track of how much her students are reading with their parents. Letter P.A.L.S. 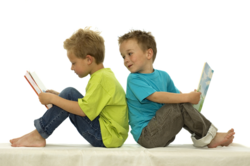 (Personalized Adventure Letter Series) gets parents involved in reading to or with their children. It provides twenty-four letters Pet Shop Pen Pals weekly letters for students and their parents to read together. Teachers sign up for their class and send a letter home to parents explaining the program and giving them the class identification number to enroll their children in the program. Each week a personalized letter with the child's name is sent to each child's mailbox. Parents login with their children to access a three-page letter that is professionally written, beautifully illustrated, and reviewed by reading specialists for use in a shared/guided reading environment. Visitors to the site can view a sample letter. Each of the letters also includes comprehension questions and answers for the parents to discuss with their children and a link to notify the teacher that the student has read the letter. The 2005-2006 program ran from October to March with twenty-four weekly letters but plans are in the works for a summer reading program and the 2006-2007 program will feature twelve letters with open enrollment at anytime during the year as well as a program for grades 3-6. Included is a section on reading together an introduction to the Pet Shop Pen Pals and other fun stuff.